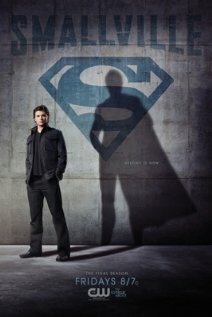 Mercifully, I finished watching Smallville recently The Wife and I really enjoyed the first season, as well as...probably season two and three. After that, it became pretty repetitive -- main villain of the season, Lana/Chloe in trouble, Clark struggles with his heritage, etc. The quality just kind of dwindled as the seasons went on. We watched every episode of seasons 1-8 and then took a break from watching it. A long break. I finally put Season 9 in the Netflix queue a month or two ago. After watching the season premiere, I felt comfortable enough to skip the majority of season 9, which had General Zod as the main antagonist. I glanced over the episode descriptions on Wikipedia and just wanted to get it over with. Season 10 went pretty much the same way. Darkseid was the villain of the season - a far more interesting choice but I just couldn't bear to watch an entire season of the show. I watched the S10 premiere, one episode 'cause it had Deathstroke in it and then the two hour finale which also felt like a chore. I have to say, though, the final 5-8 minutes of the show were really well done. Spoiler alert! They bring in some of the classic music from the Superman films, and after 218 episodes, Clark finally embraces his human upbringing and Kryptonian heritage and puts on the freakin' Superman outfit. Looking back on it, I think what wore me out on the show was not only the repetitive plots but it was more the waiting. We know where the story is going to end up. Going into it, we know Clark Kent is going to one day throw on a cape and be a hero. So when he struggles to find a job at the Daily Planet, or his powers are almost taken away by gold kryptonite, we know it doesn't matter. We still know he will become Superman. I know this series was meant to be more about the journey but it felt like so many episodes were just filler. Wow! it is awesome post. This post is only for them who has great idea. Go on with. We want this kinds of post regularly for our best.